The Islamic Regime has increased its crackdown on students in the past month. According to a recent news article from Radio Farda at least 13 students have been arrested this month. 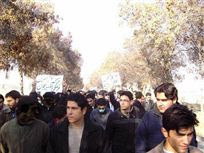 Ali Ojaghi a student activist in the city of Esfehan stated that another student activist Mr. Mohammad Mehdi Habibi (a student in Mohajer University in Esfehan) had been arrested without a legal arrest warrant on July 9th 2008. His personal belongings including his computer have also been confiscated. Mr. Habibi was able to call his family Monday night stating that he was well; however there was no mention of what he had been charged with. All of the above named students have been charged with acting against national security, propaganda against the regime, propagating lies, disturbing public opinion and promoting anti-religious attitudes. The Voice of Human Rights in Iran condemns the recent crackdown on students by the Islamic Regime and urges the international community and human rights organizations to condemn the recent crackdown, arbitrary arrest, torture and imprisonment of students in Iran and to put pressure on the Islamic Regime to stop its human rights violations.